The Normandie Hotel in Lorient, St. Barths. 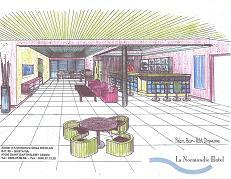 Visit http://www.normandiehotelstbarts.com for more information about this newly relaunched hotel under new management. OR CALL US TODAY TO BOOK. Else book directly online at www.flyairsxm.com. We accept all major creditcards, such as Visa, MasterCard, Discover and American Express. Above: A Cessna 208B Caravan operated on behalf of AirStMaarten, Caribbean's only virtual airline now offering flights between San Juan, Puerto Rico, and St. Barths. Double Rooms available for weekly specials in combination with AirStMaarten flights from San Juan to St. Barths. Normal rates from €95 euro per night.